Pamela Chng is the co-founder of a web consultancy firm, but mid-career, she took a change of direction, deciding to launch a social business that would empower disadvantaged women. Bettr Barista Coffee Academy trains women to become coffee professionals, tapping into the coffee culture and the growing specialty coffee industry to help its students gain job skills and overcome significant life challenges. The organisation’s six-month programme offers more than just professional training, however. It also helps women develop emotional resilience, life skills, self-defense skills, and physical endurance. 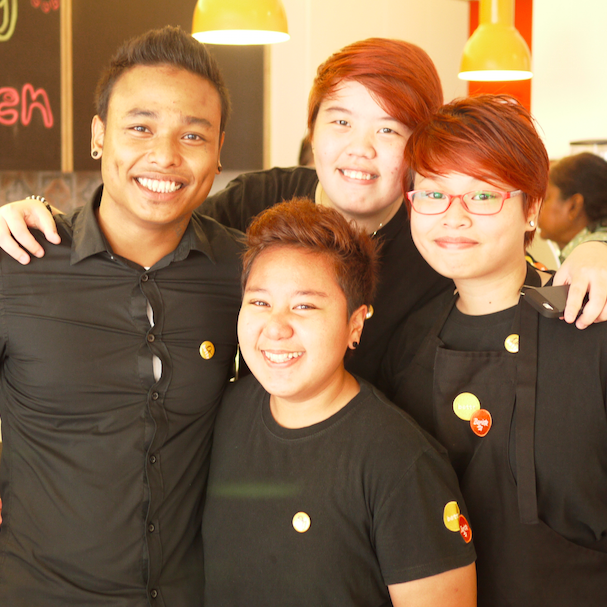 When the course ends, Bettr Barista assists students with finding employment. But perhaps more importantly, graduates emerge with a fundamental change in mindset and the confidence and skills to succeed. What inspired you to create, not just a coffee academy, but a holistic solution to help women? What was your “ah-ha” moment? Even at my first startup, that was a question that I asked with regard to my staff. “How do we help people be the best that they can be?” Helping people in this way benefits everybody around them and the organisation. Bettr Barista, as a social business, continues and expands on that question. Many marginalised people face a cycle of challenges, and breaking this cycle often requires more than just job training. Job skills are not the issue – staying in the job and thriving are. For anyone to remain employed and thrive, it takes emotional intelligence and the ability to be resilient. It takes confidence and the ability to deal with conflict. All of these intangible things need to be addressed. Professionals often have access to team building workshops, leadership courses, or other non-skill-based learning opportunities. Unfortunately, these types of resources aren’t available to those who need it most – those who have huge life challenges to deal with and who don’t have the tools or strategies to cope and rise above those challenges. There’s also the fact that we’re in the food and beverage service industry, which is a very physically demanding industry to be in. You’re on your feet and running around all the time, so if you’re physically fit, you’ll be better able to cope with the demands of the job. That removes another barrier to success – which is feeling tired and giving up as a result. Our goal is not to address the symptoms, but to understand the cause of the issues, and address them from that perspective. I would also say to aspiring social entrepreneurs, that you don’t have to start a social business – you can join one. Social enterprises need talent. It’s important to go and understand what it’s like to work in the social sector first. Because it’s not easy – it’s twice as hard! Devote a couple of years to understanding what it’s like… for your own sanity. Also, apply your talent to a social business that you really believe in. That’s a win-win for everyone. We need as many people as possible with the same mindset, working towards the same goal, if we want to really affect change at any meaningful level. We are expanding our course offerings to make them more accessible to the market. We’re also developing a coffee social franchise of sorts – I can’t share too many details right now, as we’re still finalising lots of things. But it’s a supportive ecosystem that will help our graduates take on responsibility and partial ownership of a coffee franchise. Eventually, we hope to be able to bring this outside of Singapore to other Asian countries like Thailand and Indonesia, for example, where there are many women and young people we can help. We’re working hard to find the right model for each country, because you have to contextualise your approach, even if your model is scalable. That’s what’s going to keep us busy in 2015… I’ll share more details when I can! Editor’s Note: This post was written by Kristie Wang. Pamela Chng is a thought leader of Makers of More: Your Idea, Your Community, Your Action, a challenge launched by Arthur Guinness Projects and Ashoka in support of ideas that go beyond the ordinary to help unlock the potential of communities around the globe.